Now we know in part; then we will know fully. Drive down the main street of the city in which I live and you’ll see them: big, old, church buildings. There are at least a dozen of them that sit either completely empty, devoid of all activity, or inhabited by congregations of less than 50 people looking quite scarce in their cavernous sanctuaries. A few have “For Sale” signs on their lawns, a few are condemned, a few are being used by smaller churches paying minimal rent (which is great! ), and even one is being turned into a high-rise condo. There were days when these buildings were packed. Those days are gone. Someone, somewhere along the line, felt compelled to rally people around a fund-raising project and to build big. Thankfully in those days, the majority of the buildings were constructed with theology and beauty in mind. Yes, sometimes at the expense of function, but what we have now are at least buildings that, from the outside, add to the look of a city. 100 years from now I can’t imagine that the same will be said of the mall-style churches that are built these days out in the suburbs or warehouse districts. But whether it’s a century-old beauty or a brand-new mall-style building, there is an unavoidable and obvious truth: buildings don’t last. They fall apart eventually. They don’t get better with age. They demand upkeep and a whole lot of money to maintain infrastructure. Millions of dollars are spent on maintenance let alone the amount spent to originally erect the facility. And where does that money come from? Usually the people who make up the church congregation. I’ve worked in a money-sucking church building. It was one of those projects that was undertaken at the height of “success,” only to go through the inevitable shrinking of its congregation. It became an 1,100 seat auditorium hosting a congregation of 300. When the numbers went down, the building became a heavy weight around that congregation, doing more than just demand money; it deeply affected the psyche of the congregation. The building and its issues became to define the church. Unfortunately my experience is not uncommon. In my denomination alone we have several of these stories. But here’s the kicker: we just keep doing the same thing. I presume that in many cases the early days of all big-building projects and capital campaigns are exciting. No doubt some buildings have been constructed for less-than admirable reasons, but generally I’m sure most have been built because people were coming to the church or settling in a neighbourhood in such numbers that a structure to facilitate the group needed to be created. And in those moments, I wonder, where many people asking this question: “Who is going to pay for this in 20, 30, 60, 100 years from now?” I bet that question isn’t asked very often because in the midst of the excitement, it likely feels like whatever this is, it will never end. For 2000 years there have been local church congregations. And for 2000 years every church that has been birthed has eventually closed its doors. The Church will last forever. But Scripture does not give us any indication that the local church will do the same. Every church that builds will someday be tasked with figuring out how to maintain and sustain their infrastructure while dealing with dwindling congregations. History suggests that this is an inevitable outcome. So why do we not pay attention to our past? Why do we continue to raise millions of dollars on a particular type of infrastructure that has shown itself to be unsustainable? Do the ends justify the means? Does facilitating current excitement and growth justify hamstringing future generations with all the problems that come with big infrastructure? Why build big instead of building small in multiple locations — forming new contextual outposts of the Gospel in new communities and neighbourhoods? Why build big and new instead of investing in existing structures and helping to solve the problems of brothers and sisters in Christ who are saddled with deteriorating buildings? I believe that building big and raising the money to do so should be an absolute last resort — the idea at the bottom of the barrel. There are better options. I appreciate that infrastructure of some sort is needed to facilitate local churches. We need space and that’s not a bad thing. What I’m suggesting is that we don’t do a very good job of stewarding, creating, and using the right kind of space. We too often fail to ask the right questions. Instead of giving future generations within our churches the blessing of appropriate infrastructure, we saddle them with the types of infrastructure that make maintenance and the constant need for money the defining aspects of their church. Instead of an infrastructure that is agile, low-maintenance, and ready for the constant shift in both our churches and culture, we leave them anchored to something that will end up driving their values and daily discussion. I have yet to meet someone from a large church turned small that is saddled with a big building where the burden of the building has not become the thing around which all other conversations are centered. I am convinced that the direction and movement of our Canadian culture demands that we evaluate our building habits. Right next to the hall in which our church gathers and where my office is located is a cemetery. It’s an old one (by Canadian standards) containing the resting places of a few people from as far back as the war of 1812. I often walk the path through the cemetery on my way to appointments or when I’m just out for a stroll. Cemeteries are odd places. You feel sorrow, pain, death, and suffering. As a Christian you also feel hope, resurrection, and a sense that this is not the end. Either way, though, walking through a cemetery is a good way to remember something very important: you will die. It’s a great way to regain perspective. I hope that this post is a bit like walking through a cemetery: a pause in which we may find perspective. Because your church will die, or at the very least it will get smaller someday. You may disagree with the perspective I’m presenting. That’s okay. But the pause may be beneficial none the less. Perhaps God has something else to say to you while you think on your (church’s) eventual death. This entry was posted in Church Planting, Theology and tagged Ancaster, Ancaster Village, Capital Campaigns, Church, Church Buildings, Church Planting, Fund Raising, Theology. Bookmark the permalink. I should say, I think there are churches out there doing a great job of trying to address this issue in different ways. The Meeting House, a high attendance church, rents movie theaters. As I mentioned in the post, there are a good number of churches that have partnered with other big-building churches in the use of their facilities. I love it when those partnerships become even deeper than simple facility usage; this sort of thing can become a beautiful expression of ecumenism. I believe that there are all sorts of creative ways to break the cycle of building big and, literally and figuratively, paying the price. Hi, Aaron. Thanks for this. You are right: this is a major problem. One solution is what might be called the Holy Trinity Brompton model of church planting, where a team plants into an old, disused church building. 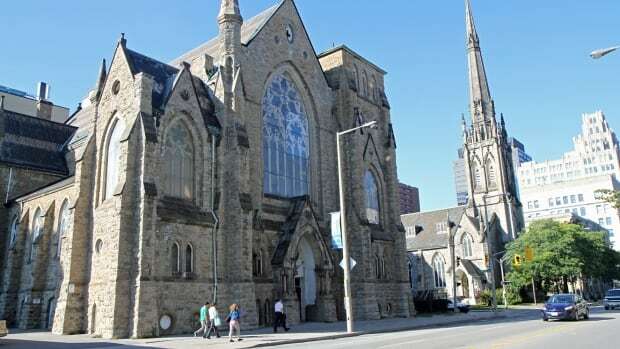 This is presently happening in Guelph, where a team from Lakeside Church (led by a former HTB staff member) has bought a downtown United Church building, and is doing very well. (Google Lakeside Downtown, Guelph.) 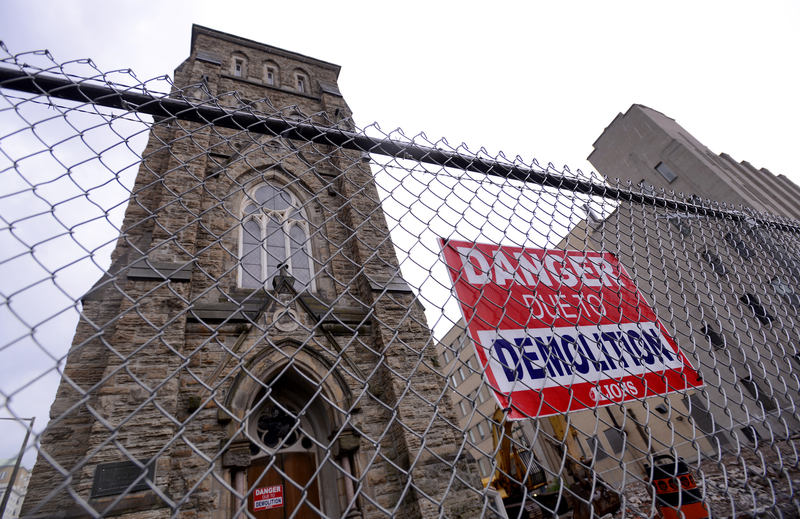 There is also a growing move among mainline churches (who are generally the owners of old, expensive downtown churches) to agree to sell their properties to new, perhaps ethnic, congregations which are growing and need space–even if this means losing money on the deal (gasp! )–for the sake of the Gospel. Once we lose these strategic locations for Gospel witness to developers, we will never get them back! But . . . you are still right, that expensive maintenance will always be a drain on congregations using these buildings.